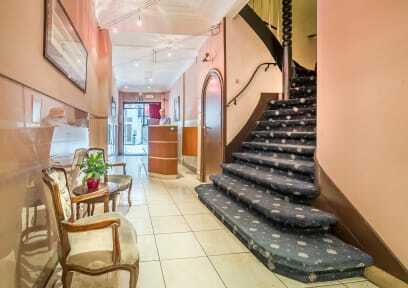 It is centrally located, near Grand Place (3-4 min) and Central Station (5 min). Very convenient location for any traveler, that’s why I choose it and I was not disappointed. The hotel is descent, clean and safe. I had a pleasant and secure stay. My friends and I enjoyed our stay here. It was in the middle of a fun and busy area, so we didn't have to go far to find things to do. Breakfast in the morning was great! Its location is the best part of this hotel. It's difficult to beat: close enough to the station and central enough to be within walking distance of all the sights. It's also on a street close to bars and restaurants, so you won't struggle getting back after a late night. The room we stayed in was small, but it was clean. It was comfortable enough for a night. The only issue we had was the noise. The walls were so thin, we could hear every foot fall, snore, and door. Super convenient position in the middle of the center, rooms are clean and big, and cheap for the position. Breakfast is not included (7.5 euros more), and I haven't seen any kitchen or other facilities (we only stayed 1 night), but I would definitely recommend it for a weekend away. It’s a nice hostel in the heart of the city. It was very easy to access. We booked a double private room. The rooms were clean. But nothing special. Sometimes it can get loud at night since it’s on a street with multiple restaurants and bars. Overall, the stay was good. It did its job! Hotel room was very outdated. We checked in and noticed the comforter (a very thin, cheap blanket) had holes in it. We pulled the comforter back and two black hairs were on the pillows! Needless to say, we were completely grossed out and could not even accept switching to another room. We left and booked another hotel. The front desk said our date was non refundable. We emailed the hotel and manager refunded the stay, for obvious reasons. Would not recommend this hotel.